Now Justinmind Prototyping Tool is FREE! Just what you’ve been waiting and wishing for… Justinmind is now available FOR FREE. Do you want to make every penny count but still need the right wireframing tool to engage with clients? We’ve got what you need. Say hello toJustinmind’s free version.And we’re not talking about a limited time trial; we’re talking about unlimited projects and unlimited screens for free, forever. For start-ups or/and freelancers or for all of you who deal with small projects, Justinmind Free offers you the opportunity to appraise, when you are at the initial stages of the creative process, how your project is going to work at the end. There is no need for coding therefore, any client requests/changes are made easily and quickly, meaning that besides saving you money, in the end Justinmind will also save you time. With the FREE edition, you can build as many prototypes and screens as you wish, without limits. You can simulate them with the internal simulator to preview the complete experience as in a real device. You can use all the Interactive widgets for the web and for mobile devices that are already pre-loaded in Justinmind. i.e. UI kits for iPhone, iPad, iOS, Android phone and tablet, Google Glass (and more coming soon). You will learn to appreciate the immediacy and explicitness of Justinmind, which will allow you to create something real and clickable very quickly. 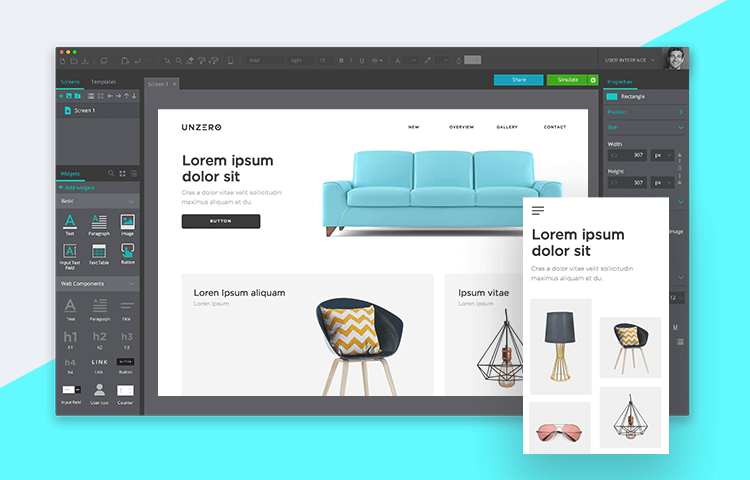 In fact, with Justinmind you can do everything through drag-and-drop, from drawing components to links and interactions. You will be able to include images in your wireframe and create clickable regions with the hotspot tool. Once again, more than just bare page changing, you will have a first version of your website or mobile app to show your colleagues, clients or possible investors. Our goal is to offer the software to a wider range of users, from big corporations to freelancers and in between. Professional or Free, each version is suited to fulfill your specific needs and your client’s requirements. We invite you to use it and to give us feedback.